The study of Manchu archery lead me to move in many circles and interact with people from all walks of life: Craftsmen, historians, scientists, collectors, exponents of living traditions, conservators, curators, auction staff, publishers, librarians, researchers, restorers, and many who combine several of these traits in their daily lives. People with colorful personalities and unbridled opinions about their purist passions, many of them became friends over the years. A tribute to the many colorful characters I've met along the way that helped me grow. It was his website ATARN.ORG that sparked my interest in Manchu archery, and presented plenty of material to get me started. The website was built from 1996 onwards and his book "Chinese Archery" followed in 2000. He truly paved the way for me and many others, not in the least the Chinese themselves to rediscover their archery heritage. Indeed, it were his efforts upon which most revivals of Chinese archery have been based or at least inspired. Through important contributions like the interview with Wu Yonghua or the publication of many Chinese archery manuals the website introduced us to a wealth of info while the ATARN.NET forum connected other researchers, archers and craftsmen since well before the rise of social media. It was through the forum's 2007 member list that many who are now my friends got to meet at that legendary first World Traditional Archery Festival in South Korea. This is also where I first met Stephen Selby in real life, a true gentleman, who has been kindly supporting my efforts since. A well-known and respected restorer and connoisseur of arms and armor, most people into antique Chinese arms have read his work or have dealt with him as a restorer. I also met Philip Tom through my interest in Chinese edged weapons well before I got into archery. Mutual interests soon turned into a friendship and fruitful cooperation, now at Mandarin Mansion. His thorough understanding of the matter and his clear but very own explanatory style have been an inspiration to me and many with me, and I consider myself lucky that he's often been there with a critical eye to show me the gaps in my reasoning while presenting better ways to deepen my understanding. He provided something better than just answers, he showed me the way to get them. Not being a trained historian myself, it was Philip who put my interests on the right track and showed me how to conduct thorough research. See a showcase of Philip's restoration work. Or ead his article, Some Notable Sabers of the Qing dynasty in the Metropolitan Museum of Arts. An exceptionally industrious fellow, Hing Chao is into cultural heritage preservation in China and Hong Kong in many different ways. He has a constructive and down-to-earth view of preserving heritage by giving it a useful place in our modern time. From organizing martial arts festivals to the development of sustainable villages in present-day Manchuria, up to recording a pop-CD in a nearly lost language. He is among others founder of the Orochen Foundation, executive editor of Journal of Chinese Martial Studies and columnist at Hong Kong Tatler and executive editor of Hung Kuen Fundamentals: Gung Gee Fok Fu Kuen. Hing is not just a dreamer, he gets things done. Always full of plans and ideas, one wonders how he finds the time to do so many things so successfully. It was Hing who significantly broadened my view of the peoples of Manchuria and who brought incredible nuance to what I thought was "Manchu". We have been pleasantly collaborating and exchanging information for a few years now, and I am excited about things to come. Keep up the excellent work, Hing! Murat and I met on the first world Traditional Archery Festival in Korea back in 2007. A charismatic man who clearly did his homework, driven to build up Ottoman archery from the ground again. Although working in different fields we used similar methods and shared the same deep passion for the cultures we studied, so and we stayed in frequent contact since. Murat is always working on something interesting, be it in research, practice, or overall self-development. 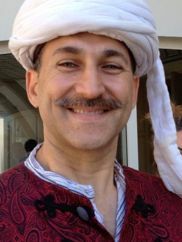 Murat is founder of the Istanbul-based Tirendaz, the first group to recommence the study of traditional Ottoman archery in Turkey. He is also author of many articles in various international media, as well as the Turkish language book: Okçuluk hakkında merak ettiğiniz her şey which translates roughly as "Archery, everything you wanted to know". You can see him do trick shots with Turkish archery equipment on his youtube channel. Murat has diligently developed himself as a thorough scholar and very respectable archer and is often seen as the "face" of the modern revival of Ottoman Turkish archery. But most of all, Murat is a good friend. Cheers mate! 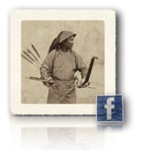 Ku Ku is most likely the last formally trained Manchu archery alive. Ku Ku is daughter of the famous martial artist Tong Zhongyi. A martial military family, their ancestors were close to the imperial line and most had been enlisted among the Manchu military. Tong Zhongyi was at some point imperial guardsman of the last emperor, Puyi. He was a wrestler, swordsman, heavy bow puller and competent archer from both foot and horseback, and author of the classic The Method of Chinese Wrestling. Although he thought that much of what he knew was irrelevant for his daughter in the new China of the Republican era, he did train her in wrestling and target archery, and she reached competency in both. In 1957 Ku Ku won a gold medal at the last Chinese competition shot with composite bows. It was an incredible to meet a living exponent of the tradition I had studied so diligently, something I had long not deemed possible. 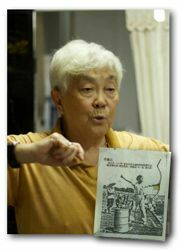 Our encounter resulted in the article INTERVIEW WITH KUKU, THE LAST KNOWN MANCHU ARCHER, published in Journal of Chinese Martial Studies, Winter 2012. Issue 6. Three-In-One Press, Hong Kong. 2012. At first she was surprised that a Westerner would take such an interest in her near-extinct style, at the end of the visit she said: "There is hope". Needless to say, Ku Ku's influence on my current understanding of the classic Manchu archery method is profound. Justin Ma is a well-known promotor of Asian archery in the United States and since a few years we organize the annual Chinese Archery Program together with Jaap and Kay Koppedrayer at their estate. Apart from his broad interest in Asian archery, Justin is a researcher and practicing archer in the Ming dynasty military style of Gao Ying and together with Jie Tian recently finished a book on this subject: The Way of Archery: A 1637 Chinese Military Training Manual. 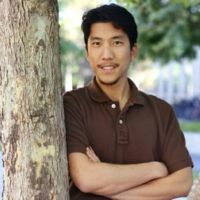 He is a software engineer by day and is also behind www.cinnabarbow.com where he keeps a page with archery notes and sells traditional Chinese archery equipment. 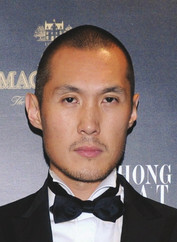 He is also the founder of the Chinese Archery group on facebook. Justin is not only a competent archer but also a very good teacher. He has a deep understanding of what happens inside the body and is good in articulating what needs to be corrected and how. He walks the talk by being able to pull heavy bows using his technique, and he is a good shooter. Justin and I have been in contact for many years and we have since been meeting at archery events all over the world. We are continuously exchanging information about our styles and his insights on posture and training methods have always been very valuable. Bows and arrows aside, Justin is just a great guy. He's got all the traits that make some of the great traditional archers of the day: Knowledgeable, unpretentious and with a good sense of humor. Ming dynasty archery and traditional Chinese bows, Justin Ma. Society for the Promotion of Traditional Archery, Hilary Greenland. Korean traditional archery, Thomas Duvernay. Turkish traditional archery, Murat Ozveri. Chinese traditional archery, Chen Yang. Asian Traditional Archery Research Network, Stephen Selby. Dutch Warbow Society, Magén Klomp. Orochen Foundation, by Hing Chao. Manchu forum by Namutu. Thanks to our Manchu friend Šolontu. Jumpsuit Art by Deon de Lange, the man behind the graphic design of the site logo. Society of Archer Antiquaries current honorary secretary, Hugh Soar. Ottoman Turkish bows by Adam Karpowicz, Ottoman bow researcher and (non-commercial) bowyer. Reproduction armor by Ceasar Ziyu Zhang.